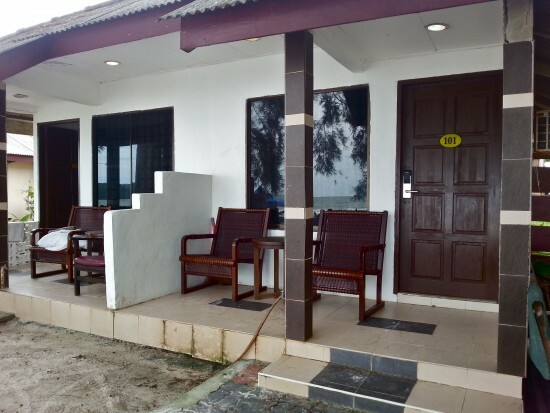 Finding a Pantai Cenang beachfront hotel at affordable prices becomes more challenging as Langkawi’s popularity grows, but one hotel that has managed to survive the times without a massive rate hike is Langkapura Inn. 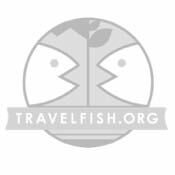 With rooms starting at 140 ringgit and having Pantai Cenang as its front yard, this is a flashpacker winner. Some of the rooms in the original hotel are a bit on the smallish side and some are more worn than others, but with white sands at your doorstep and fair prices, there’s not much to really complain about here. The recent addition of a two-storey wing however offers even more spacious suite options for the more selective travellers. The standard older garden view rooms start at 140 ringgit per night while a standard in the new building is 160 ringgit, including breakfast for two. Prices run up to 250 ringgit per night for a super deluxe room that sleeps six. Not much for decor, but it sure is clean. Each room comes with air-con, mini-fridge, electric tea kettle, hot-water shower, flat screen TV and its own small veranda that is guaranteed to catch the sea-scented breeze as it wafts by. There is nothing to write home about in the interior decor department, for the off-white and pastel painted walls are void of even the smallest of decorations. But that and the shiny tile floors keep the place neat and tidy and it’s all sparkling clean. The location is ideal for those who appreciate convenience but don’t want to be smack dab in the middle of the buzzy touristy action. Langkapuri Inn is somewhat buffered from the wall-to-wall shops and restaurants of Pantai Cenang by being tucked just off Jalan Pantai Cenang in a small sandy parking alcove it shares with its immediate neighbours. There is a well-stocked minimart, a basic spa and a couple of souvenir shops next to the hotel’s reception office. Underwater World Langkawi is just a few doors south, along the main road, where you can find plenty of taxis as well as a few large duty-free shops. The beachfront at your doorstep. A small on-site restaurant opens for breakfast and serves food throughout the day and plenty of other dining options lie within walking distance as well. Although Langkapuri Inn has sunsets dibs, those who want to have a sundowner can slip next door to Yellow Cafe, which has a 16:00 till 18:00 beer special. For something slightly more upscale, the Cliff Restaurant and Bar is just south of Langkapuri Inn behind Underwater World. Perched at the end of the rocky headland waterfront, they serve delicious cuisine with a sunset view of the sea and expansive Pantai Cenang shoreline. Old building. Seaview 170 ringgit. New building 160 garden, 170 sea view. 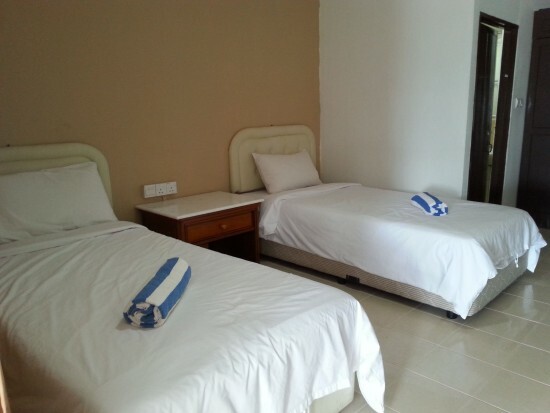 Room: Standard double room, low season: 140 ringgit, high season 140 ringgit. Notes: Old building. Seaview 170 ringgit. New building 160 garden, 170 sea view.